As many of you know, I left my 2.5 year career as a Web Designer at Nordstrom this week. Next week I'll be starting a brand new adventure at Amazon doing Senior Design / Art Direction. With a big life change like this I'm looking at various opportunities in my life to cleanse and start anew! First came a full closet spring cleaning followed by a few Goodwill runs. And now, comes a very important space to cleanse - my desk. I packed up my bags at Nordstrom with my office supplies and desk knick knacks and they've been sitting in my apartment ever since waiting to be organized. I want to have a fresh new look/aesthetic when starting at Amazon. 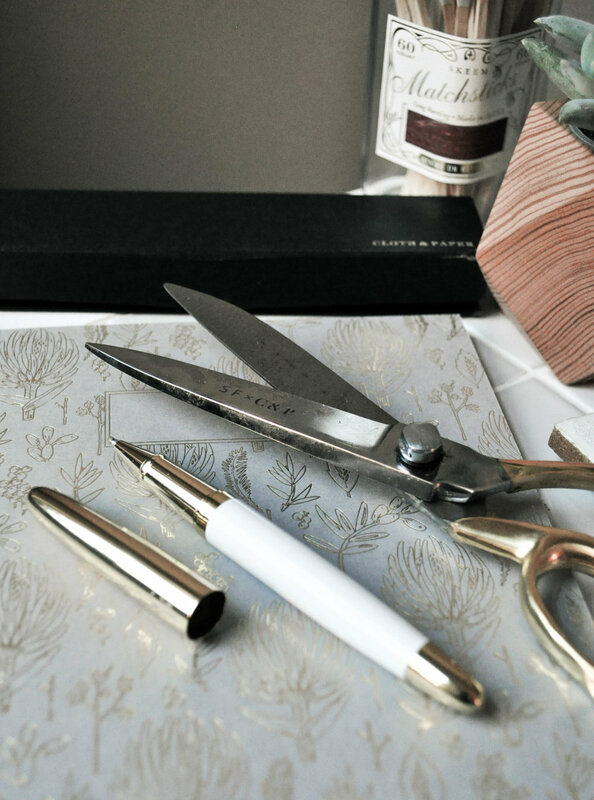 Minimal and feminine office supplies are some of my favorite things and luckily, with the help of Cloth & Paper, I'm able to achieve my dream desk space. 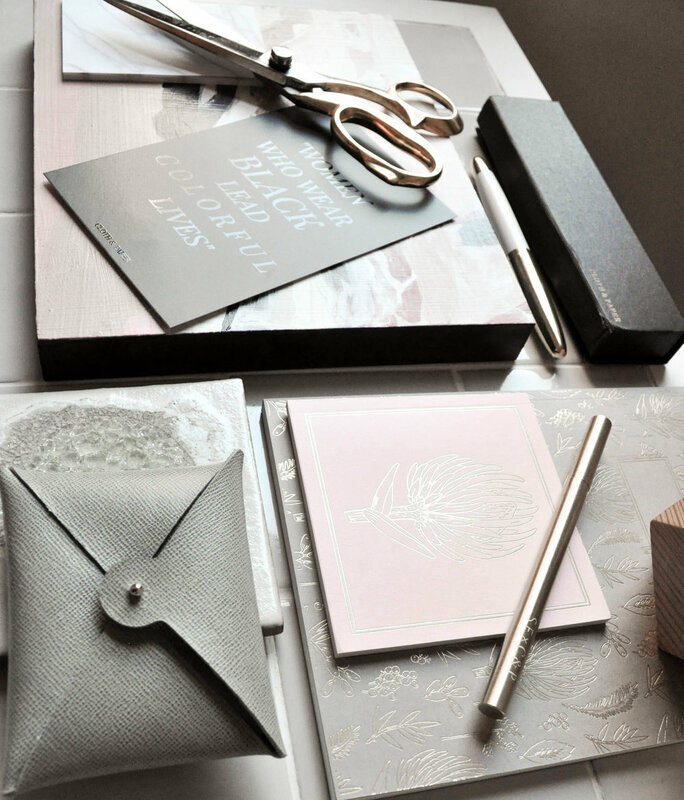 Cloth & Paper started out with goals of providing chic and innovative stationary and lifestyle brands to customers. Cloth & Paper stays on trend with the various products they offer all while providing customers with a rotating collection of desktop accessories and supplies. Here's a look into which of my C&P desk supplies have helped me stay organized, stylish and on task. I've had a pair of gold scissors on my dream office Pinterest board for way too long. When I was provided these beauties my dreams were made! 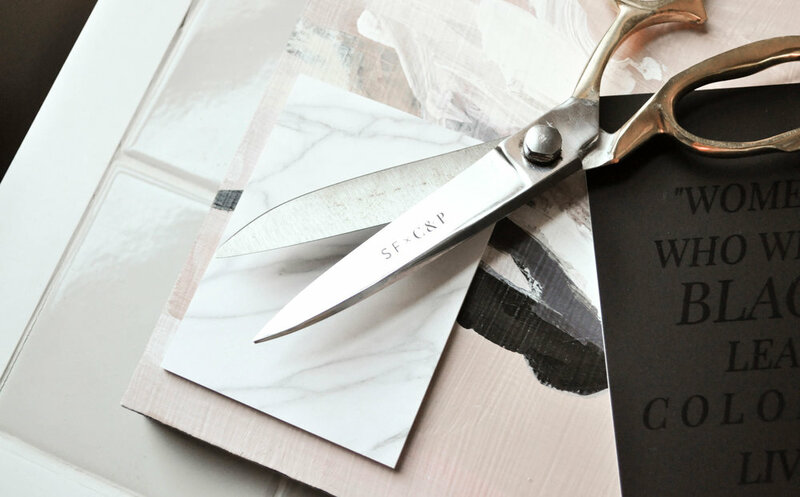 This pair of scissors is perfect for using to cut fabric or paper. It's true, I have a marble addiction (as seen by my headphones, phone case and various household objects) so how could I pass up a set of marble sticky notes!? Sticky notes are a desktop must-have especially ones of this size and style! Writing utensils are more often than not a requirement for any desktop. 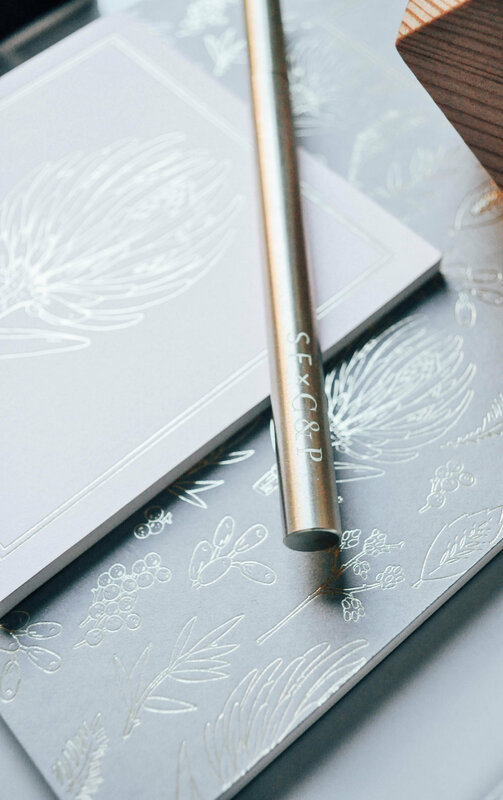 I don't know about you, but there's something about writing with a stylish pen that makes taking notes or jotting down information that much better! These gold/brass pens stole my heart and make the perfect statement when left on a desktop, paired with a planner or notebook or used solo. I have a pro-tip for those that are a collector of stationary/greeting cards like I am! Instead of purchasing expensive artwork for your office space, take advantage of your greeting card collection! I stock up on frames from IKEA and Target (often times not exceeding a $5 limit per frame and I always spray paint them if necessary), I then place the greeting card inside the frame and either prop the frames up on my desk or hang them on a wall. It's a great way to display your favorite art pieces/stylish greeting cards and it's a nice alternative to getting artwork professionally framed. 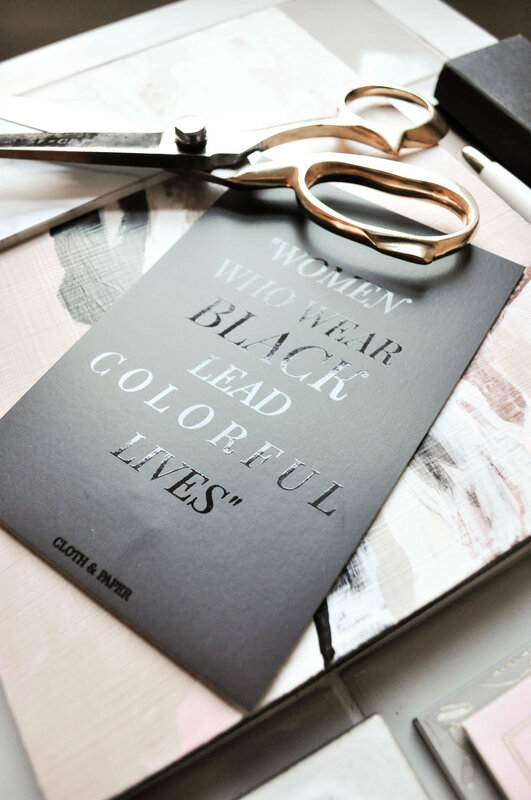 This Women Who Wear Black Live Colorful Lives card will definitely be making an appearance at my new desk space. 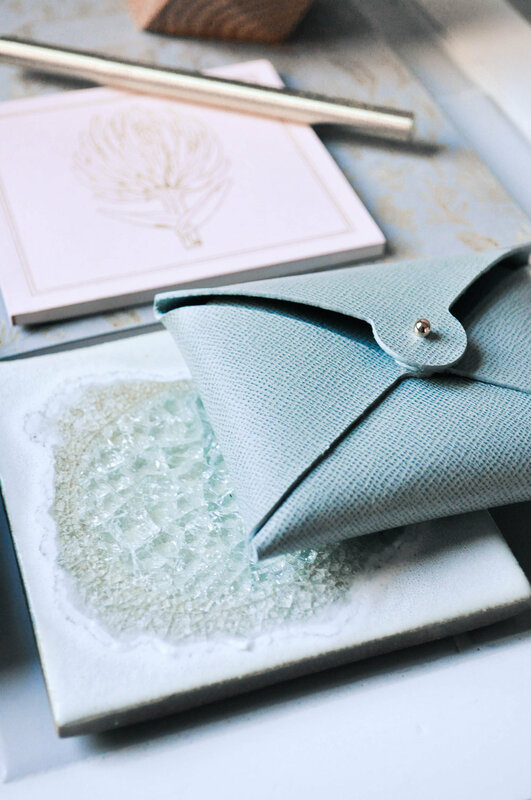 I have a love for pouches to carry coins or cards in. A pouch makes a great alternative to carrying a large purse around when you're just wanting to go on a coffee run or grab lunch. I tend to have 2-3 near my desk for easy access to get up and go without having to haul everything at once. As a designer, any sort of stylish paper goods I can appreciate. Especially when they consist of gold foil! 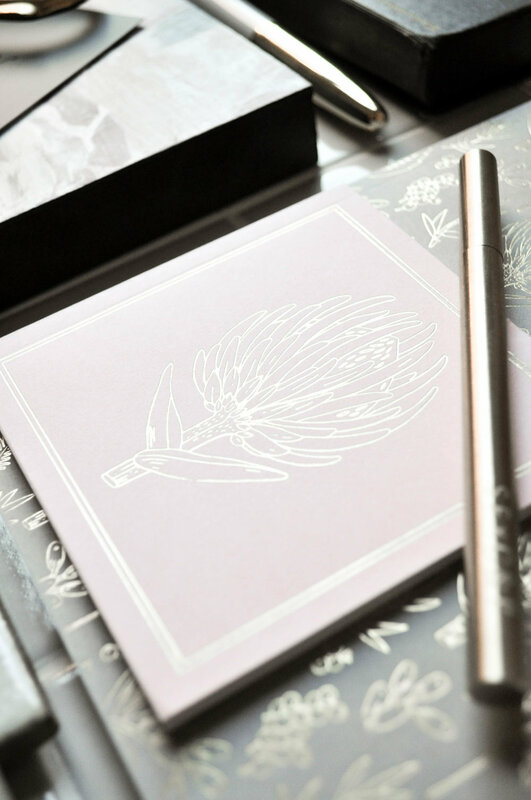 These notebooks and mini note pads are perfect to have on hand at your desk for jotting notes, ideas and thoughts down throughout the day. I prefer writing as to typing notes when I'm in a meeting so I can never have too many notebooks. S/O to Cloth & Paper for collaborating on this post!